Sport4Kids football & rugby classes are launching in Warrington in February 2017. The toddler football and rugby classes will be held at St Gregory’s High School in Great Sankey & Broomfields Leisure Centre. S4K Tots Football is for babies and younger children beginning their activity sporting life and usually ranges from 18 months to 3 years. 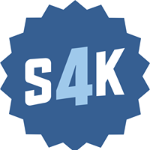 S4K Kickers is the second stage of development where children are introduced to the basics of the football game and begin to develop skills which are built upon as their ability increases. S4K Tots Rugby is aimed at providing our little ones with their first introduction to sporting life and ranges from 18 months to 3 years. S4K Cubs Rugby is the second level of development along our Rugby Player Pathway after our S4K Tots program. Bring your children to one of our FREE taster classes to experience the S4K way! For more information on Sports4Kids Football, click here. For more information on Sports4Kids Rugby, click here.